JDate.com is mainly for Jewish singles who are looking for partnerships which can either be friendship, casual dates or for deep relationships. The site is very popular to the Jewish community but that doesn't mean that it is only for Jewish people. JDate.com welcomes people from all ethnicities with different backgrounds. For this, the site has a large user base and has kept its popularity as the no. 1 dating site for all singles from various beliefs but with more Jewish members than other popular sites. The site has a few unique features that keep its members thoroughly engaged. Among them are the ability to check on "who has checked you out", private messaging, and some offline activities or events. Jewish members from the US alone compose 480,000 of the total population of JDate.com. 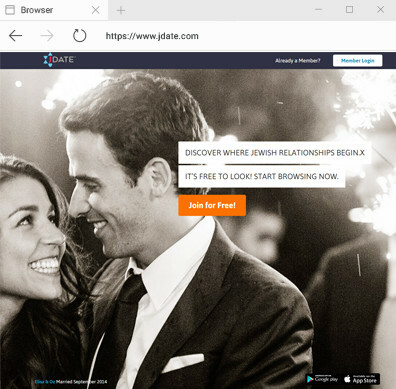 Of all the Jewish dating sites, JDate has 2 million visitors and users making it a very popular and active site to visit. There are more female members than males making the site a good place to meet a man's perfect match. Although every registered member can opt for a free membership with limited access, the site offers them the chance to upgrade for a fee and enjoy the site's unique features. There is a $3.99 one-time processing fee for first timers. The site also offers promotions such as discounts and premium plan packages. Subscription is automatically renewed. To avoid this, you must cancel your subscription before the date of the renewal. Largest user base. With the site's very large user base composed of mostly Jewish people, it isn't very hard to find the Jewish that will match one's preferences. The JDate.com community is also composed of active members who participate in offline events such as charity events and more. Daily Matches. The site offers to find its members other like-minded singles. iOS and Android apps. JDate.com offers intuitive iOS and Android apps for a more engaging online dating experience wherever the member is. Advanced features. Advanced communication and search tools, offline activities and various safety features help protect the members' privacy. Too many non-Jewish The site was developed mainly for Jewish members. Although it has been patronized by most Jewish from the United States, there are also many non-Jewish who pose a challenge to the Jewish members' faith. Another thing, if you are not looking for a Jewish then this site is not for you. Limited features for free members. Just like other most dating sites, JDate.com restricts a free member's ability to send an instant message to other members. Easy profile setup. The site immediately takes in the basic information of the new member once he/she opts to sign up or register. Efficient matching. The "Daily Matches" feature is simple and is a great way to assist the members in finding those who are more likely to be the one they are searching for. The "Secret Admirer" feature is fun and gives the members the thrill to know someone secretly likes them. Flirting and communication tools. These options allow users to use various flirting tools as well as messaging options. Paid members can chat to both free and paid members. Mobile app. JDate.com's enhanced application for smartphones and tablets make it easy for their members to connect wherever they are on the go. Fun activities. The community holds fun offline events such as mixers, volunteer opportunities and social parties that are mostly Jewish activities. Profile color. This feature called the Highlight Profile allows the user to choose a specific color for his or her profile. Also, the Spotlight Profile feature helps users find better matches by putting their profile on top of other users in the search results. The registration process at JDate.com is fast and easy as the site creates your profile by asking a few basic questions that quickly develops into the member's profile. JDate.com is mainly a Jewish dating site so it asks its members upon registration to declare its Jewish denomination. Non-Jewish who wish to join the site are asked if they are willing to convert or not. The site also provides features that are specific to Jewish members such as their choice of keeping kosher and the frequency of their synagogue visits. JDate.com offers unique features such as Daily Matches that does the hard work by finding a list of like-minded users. This gives the members more chances of finding the perfect one. JDate.com's interface is neat, pleasing to the eyes and easy to navigate around. The user can easily find the following tabs at the top of the page: Inbox, Matches, Browse, Activity, and Community. It is easy to find the tabs and buttons that can lead you to browse and find the Jewish singles who will become one's perfect match. JDate.com caters to the dating needs of the Jewish community and to those who are searching for Jewish partners. It may be for friendship, romance or any kind of partnership with Jewish people. Its user-friendly communication tools are among the unique features that make it easy to strike a new conversation with a potential match. Its large population composed of various denominations in the Jewish faith as well as an effective customer support system that provides dating advice have greatly helped the members of JDate.com find their perfect matches. Copyright © 2016 Killer Reviews. All Rights Reserved. Reproduction in whole or in part in any form or medium without express written permission of Killer Top 10 Reviews is prohibited. Disclosure: We operate as an independent online dating research and comparison site, offering consumer reviews and provider ratings. We monetize from advertisers listed on our site. This does not influence the reviews, and content we publish.